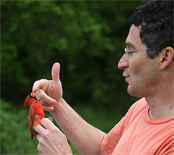 Dan is a Professor in the Department of Biology at the College of William & Mary, where he has been teaching and doing behavioral ecology research since 1996. Dan’s current research focus is on the effects mercury pollution on birds, in particular how mercury moves through terrestrial food webs and what it does to songbirds. Recent research has also included the acquisition of optimal foraging techniques by prey-dropping crows and gulls, the role of the hippocampus in sparrow migration, the significance of feather-degrading bacteria in the plumage of free-living songbirds, and the suitability of created wetlands and golf courses for breeding birds. Visit his website HERE.